The three sparkling blue-white stars of Orion’s Belt are easy to spot, even on this moonlit night. As viewed from this hemisphere, this compact line of stars can be found in the south to southeast sky at nightfall. Look in the southern sky at evening and the southwest sky later tonight. Chances are the pattern you will pick out will be Orion! You may note that Orion’s two brightest stars – Betelgeuse and Rigel – lodge at an equal distance above and below Orion’s Belt. Rigel is shown on today’s chart. Look back at Thursday’s chart to see Betelgeuse. Look again at Rigel. Because it lies some 775 light-years away, Rigel must be intrinsically extraordinarily luminous to shine so brightly in our sky. If this star were as close as our sun, it would outshine the sun by 40,000 times! Although both Rigel and Betelgeuse are extremely luminous supergiant suns, the stark color contrast between these two stars makes Betelgeuse and Rigel readily distinguishable. (Try binoculars, if you can’t distinguish color with the unaided eye.) Betelgeuse has a reddish hue, while Rigel sparkles blue-white. By the way, a star’s color is very revealing of its surface temperature. Red stars are cool (2,000 to 3,500 Kelvin) and in the autumn of their years, while blue and blue-white stars are hot (over 10,000 K) and young, in the heyday of youth. Do stars shine in color? Astronomers believe both red and blue supergiant stars blow up into supernova explosions, though at one time it was thought that only red supergiants did so. 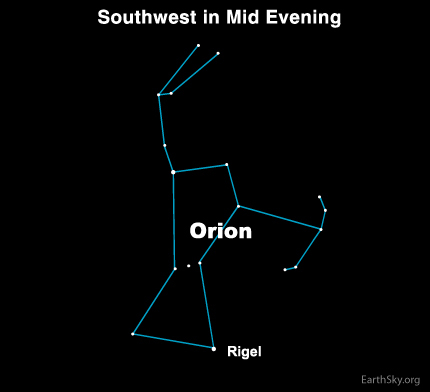 Look for Rigel, Orion’s blue supergiant star, at the foot of Orion tonight! 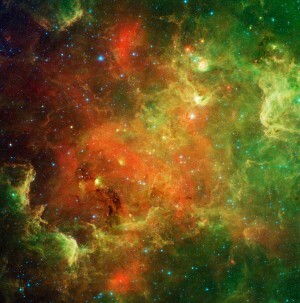 What is the safe distance between us and an exploding star?